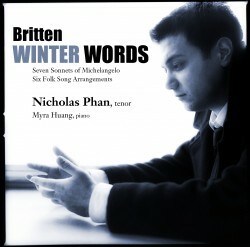 Winter Words is the solo debut release by American tenor Nicholas Phan. 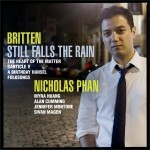 The recording was made in the wake of a recital tour in 2010-11 which culminated in his Carnegie debut at Weill Hall. 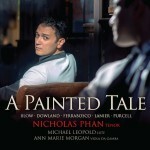 A graduate of the Manhattan School of Music and an alumnus of the Houston Grand Opera studio Nick has performed with the opera companies of Los Angeles and Seattle, symphony orchestras of Atlanta, St. Louis and San Francisco, and the Marlboro, Ravinia and Edinburgh Festivals, among others. He sang in Stravinsky’s Pulcinella with the Chicago Symphony Orchestra under Pierre Boulez which was nominated for a Grammy Award. Approaching the performance in a small Midwestern town with some trepidation (“how would they react?”), Nick describes the audience’s overwhelmingly positive response: “my favourite piece on the program … the most lasting impression.” Such is the enduring quality of Britten’s sophisticated yet direct song writing, of which Nick is a leading torch-bearer.